What makes small business owners in Edinburgh tick? That was the question that started my interview series with local small business owners about their achievements, successes and struggles – in marketing and in general. Today it’s the turn of Gino Crolla from Anima, a local restaurant in Edinburgh which serves up delicious Italian soul food. Based on Henderson Row in the heart of the city, Anima pride themselves on creating fresh, authentic Italian dishes, made with passion. 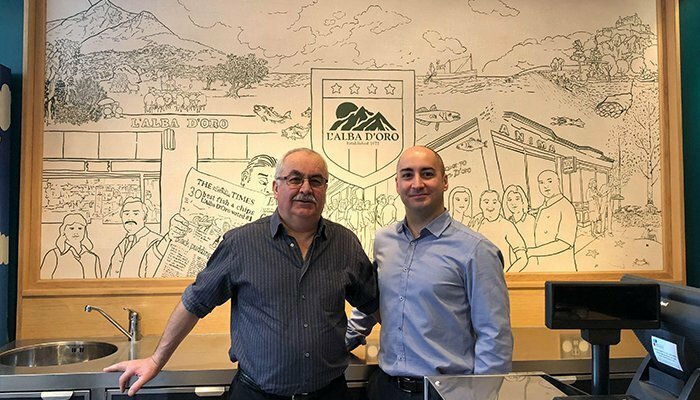 After having gained an MA in International Business in 2002, Gino went on to manage the pizza side of his parents’ famous fish and chip shop, L’Alba D’Oro. The photo above shows Gino with his father Filippo, in front of a mural which was installed in 2016 to celebrate 40 years of business. In 2004 Gino decided to separate the pizzeria and fish and chip shop, and so L’Alba D’Oro’s sister restaurant, Anima, was born. Ever since, Gino has managed Anima, along with his wife Emanuela, and has learned a lot along the way. I was literally born into hospitality and fell in love with it from a young age. Even though I graduated in International Business from Edinburgh University in 2002, I knew I wanted to be involved with food and run my own business. I am a director of two well-established fast-food restaurants in Edinburgh’s New Town; L’Alba D’Oro and Anima. L’Alba D’Oro is a fish and chip shop, and Anima sells pizza and pasta – or as we call it – Italian Soul Food. My parents Filippo and Celeste opened L’Alba D’Oro in 1975, and I created Anima with my wife Emanuela in 2004. My businesses and my family. We have worked hard to build and maintain strong brand reputations, always focusing on quality and service. Outside of work, I have a loving wife and two young energetic sons that keep me busy, and whom I love coming home to. Currently, the economic and political uncertainty surrounding Brexit, and what effect it will have on my businesses and my family’s future. I try not to worry about it too much, and thankfully it doesn’t keep me up at night – I’m usually too tired! Sticking to our business principals during the recession in 2008, when competitors were running loss-leading deals and cost-cutting on quality and service. We didn’t change any of our products or recipes, nor did we cut employee hours. We believed our customers and employees deserved to always get what they had come to expect of us, and that they would appreciate this when things got better. They did. I don’t think I’ve made any really bad decisions yet, partly because I’m slightly cautious and risk-averse. However, not taking on more risk could be viewed as bad decision-making with regards to capitalising on opportunities. My father has always told me, “Give your customers quality and service and charge a fair price. You will never go wrong.” He is right. I would rather a customer thought of us as premium but worth the money, rather than think our product was poor, regardless of price. Food and drink is a fiercely competitive industry, and nowadays people are inundated with marketing materials and social media channels. We mainly use leaflet drops or social media to attract new customers, but it can be difficult to gain new customers with these methods. Gino with Carol Wright, who has been working in his family’s business since before he was born – 38 years and counting! I enjoy talking about what we do and why, whilst adding a background story or information around the topic. Potential customers need to know what makes us unique in our product offering, and current customers need reassured that they are making the best choice when they buy from us. I enjoy cycling (only when it’s sunny!) and going to the gym. I also coach junior club rugby which I really enjoy. When I just want to relax I listen to music, and I have a wide-ranging taste in genres. Perhaps an obvious choice for many, but I love Apple and their products. I really like how I can work and play from any of my devices, anywhere in the world, and all my data is synchronized. Once you have bought into the Mac OS/iOS ecosystem, everything just works seamlessly (most of the time). I would love to travel more, but whilst my kids are still young and at school, and I am running two businesses, there are obvious time, logistical and operational constraints. When my children are less dependent I’ll become more adventurous! As I mentioned already, uncertainty around Brexit will be a key factor on how things play out in this country. Until we know what the future could look like, many people will put their plans and aspirations on hold. I would like to see a stronger UK emerging from all of this, and a more confident economy and job market. If this materialises, I would consider expanding into another business, but perhaps completely different from what I already do. I like challenging myself! Find out more about Anima on their website, anima-online.co.uk, or by following them on Twitter, Instagram or Facebook.